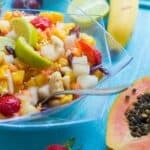 Tropical summer fruit salad – hydrate your body this summer with this fruit salad consisting of melon, banana, papaya, pineapple, mango and strawberries. As the weather is set to continue to soar in the UK I think it’s about time that I unleashed a few summer time recipes. Let’s do a huge swap here, kiss goodbye to the soups and one pot comfort food and say hello to the vibrant fruit and veggies. I don’t know about you guys but I love the warmer weather, aside from the few complaints about the humidity, most people enjoy the hot, sunny days. If you didn’t know before the UK is known for it’s terrible weather, yes that’s right, if you plan to visit to the UK always bring an umbrella, it’s a standard joke with an element of truth to it. During the hot climate I like nothing more than to indulge in light salads and increase my fruit intake by a third. My appetite for solid food is non-existent. This change is appetite is relatively normal since the body requires more water to stay hydrated, fruit and vegetables play a key role in aiding our water content since they contain a large amount of water. It stands to reason why we stun the hot food in favour of something that’s cold and juicy, so fear not you’re not abnormal. Another way you can take advantage of the warmth, as I know us women worry about our weight, is to aid some weight loss. 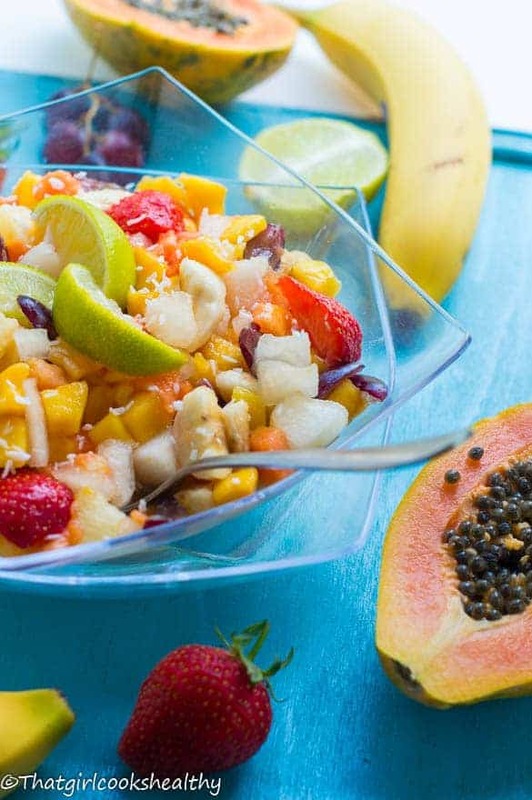 Yes, that’s right this tropical fruit salad is guaranteed to assist with your weightloss goal I can attest to that. 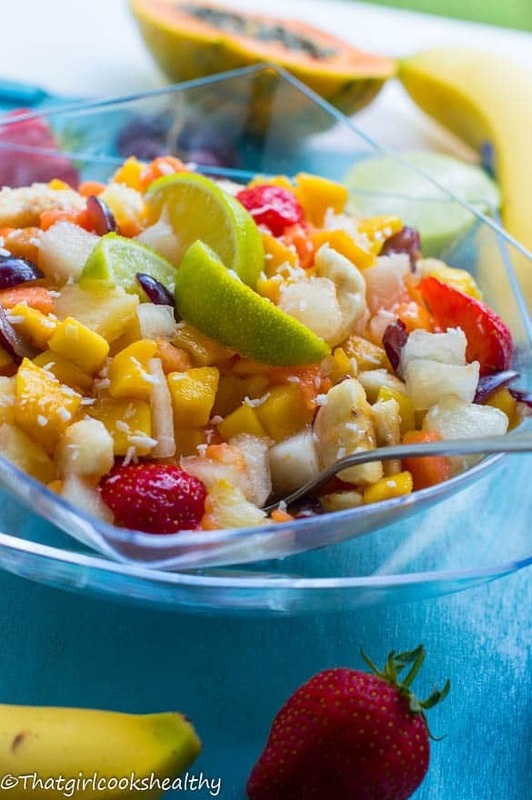 My tropical summer fruit salad contains admixture of exotic fruits which compliment one another. I’ve been eating this fruit salad bowl now for a few weeks prior to showcasing it on my website. You can’t go wrong to chopping up some fruit and arranging them in a bowl, surely not? Definitely not. What we have here is a selection of overly sweet fruits – papaya, pineapple, mangoes, banana, honey dew melon, sweet red grapes and strawberries. Granted the latter two don’t really qualify as your typical tropical fruit BUT…their sweetness should win you over. 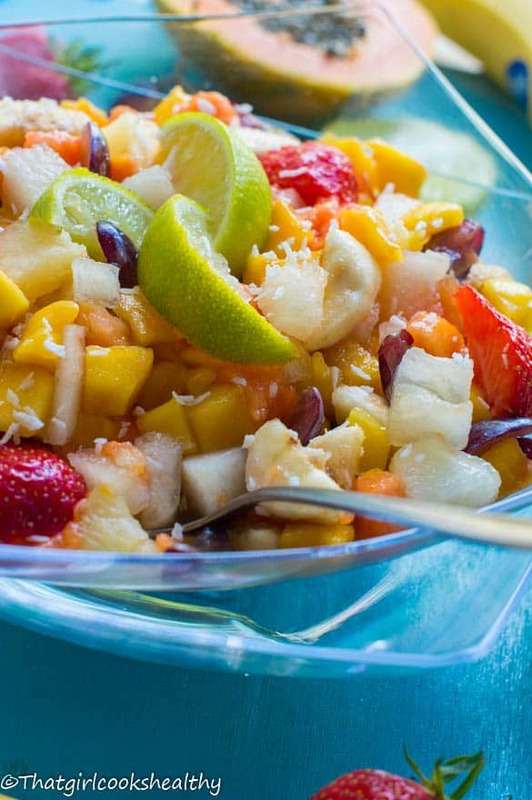 Let’s get into the summer spirit with this delicious tropical summer fruit salad recipe. Gather all of the fruit and arrange accordingly in a bowl, ready to serve. Yes, it certainly does, doesn’t it? 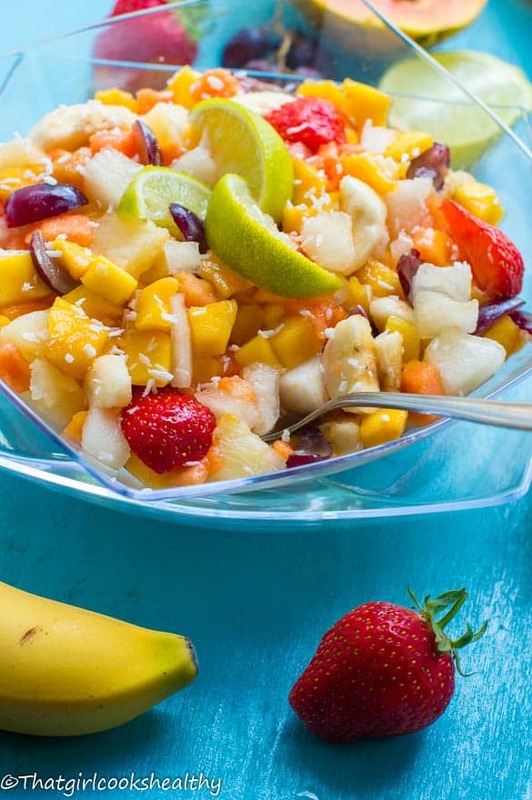 Fruit salads are an all time favorite. Thanks for the share. You’re welcome. I love them during the summertime. Oh my Charlene, your salad looks amazing! Love pineapple and papaya. Yay! I’m a huge fan of pineapple and papaya too. I love the addition of coconut! I add coconut to almost anything, even fruit salads. Charlene you know I love me some tropical fruits- I have a version that have will be posting next week. Yours make me want to grab a spoon. Nice! I cannot wait Imma, you know I’m a huge fan of your work, so I already know what to expect. Welcome Maria and thank you so much for your beautiful comment.